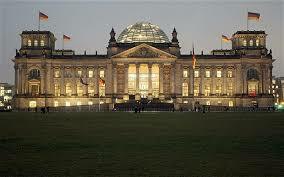 BERLIN — In Germany – stable, reliable, almost-politically-boring Germany – it was everything as expected. Well, almost… As predicted for weeks and months, Chancellor Angela Merkel and her Christian Democratic Union (CDU) were re-elected to a fourth term in office in the German federal election on Sunday, Sept. 24, 2017. Germany’s first woman and first east German-raised Chancellor – often called “Mutti” (the affectionate German diminuitive for Mutter, or “mother”) – will become, when she serves her full term, the co-longest-serving modern prime minister in the country, equalling the 16-year record of former CDU Chancellor Helmut Kohl (1982-98). Not only was the election predictable, thanks to the reliability of German polling and the consensus-driven centrism of the voters, it was also punctual. The exit poll results were announced less than five minutes after the TV election show came on at six, the unofficial actual results were in by 6:15, allow another 45 minutes for the agony and ecstasy of leaders’ speeches, plus the usual what-will-happen-next speculation, and you could still make your 7:30 dinner reservation at Clara Vere or Stella Alpina (two of the better eateries in my Berlin neighbourhood of Charlottenburg). No Trump-Clinton cliffhanger or Brexit nailbiter here. So, the center held, sort of (I’m coming to the “sort of” part in a minute), and if you weren’t quite sure where the center was these days, it said right there on Chancellor Merkel’s speaking podium “Die Mitte” (“the middle”). Contrary to the forebodings of Yeats’ famous poem, “The Second Coming,” things weren’t falling apart, nor was “mere anarchy loosed upon the world,” but there was enough crumbling (and grumbling) at the edges to disconcert good Burghers (the usually stoic middle-class citizenry). Per Yeats, “the worst [were] full of passionate intensity” and if the “best” didn’t exactly “lack all conviction,” it wasn’t all that clear what their convictions or their policies were. While that third of the total vote is enough for the CDU/CSU amalgam to remain Germany’s primary political party and to occupy 261 seats in the variable-sized and rather swollen 709-member Bundestag (or parliament), it nonetheless marked a sharp decline in party fortunes. In the last election (2013), the CDU had 41.5 per cent of the vote and 311 seats. 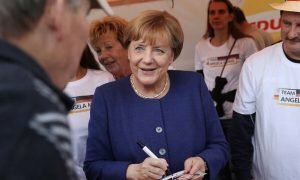 That means that this time around the center-right governing party lost more than 8 percentage points, and some 50 seats, the largest loss of the night for any party – and that made Merkel’s predicted victory bittersweet at best. Although a decline was expected, the outcome was at the low end of poll predictions and made Merkel look a little more careworn than she normally does. 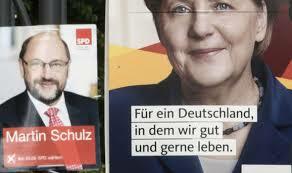 2.Germany’s other major (or “establishment,” as we like to say these days) political formation, the Social Democratic Party (SPD) — under the new leadership of Martin Schulz, the former president of the European Union’s (EU) parliament — finished second (as it did in the last election), but it too was seriously diminished. The SPD received 20.5 per cent, down from 25.7 per cent last time out, a 5 per cent loss that marks the party’s lowest vote count percentage in recent decades. It’s true that mainline parties across Europe (in France, the Netherlands, and Austria) have all been bleeding support in recent elections, and it’s true that the shrinkage in Germany is less than elsewhere, still it’s the case that the CDU-SPD major party combination that amounted to two-thirds of the vote in 2013 is today down to just over half the count. Merkel and Martin Schulz (r.). One trend in recent Social Democratic history deserves to be flagged here. Ever since the social democratic left-of-center — in the U.S., England, Germany and elsewhere — sometime in the 1990s and through the turn of the millennium — “modernised” itself into a more pragmatic, self-described “Third Way” entity, it seems to have sacrificed its political responsiveness, socially innovative policies, and its working class and trade union roots. It became friendlier to globalised capitalism, business deregulation, and it continued rather than repudiated the anti-welfare state policies brought in by conservatives like Ronald Reagan in the U.S. and Margaret Thatcher in Britain. Figures such as Bill Clinton, Tony Blair in the U.K. and former chancellor Gerhard Schroeder in Germany are as much the progenitors of the modern form of what we call “neoliberalism” as the free market conservatives they often decry. In these times of populism and outrage-for-all, the SPD is paying a price for past mistakes, and the party’s current leader, Martin Schulz, was unable to overcome that legacy. 3. If there was a surprise in the election, it was the breakthrough success of the far-right party, Alternative for Germany (AfD). Although it tallied a modest 12.6 per vote of the vote, that was more than enough to put an extreme right-wing German party in the Bundestag for the first time since the era of Hitler. It scored the largest vote increase of the evening, an 8 per cent improvement over their 4.7 per cent finish in the 2013 contest. What’s more, the version of a proportional representation system that Germany uses will yield more than 90 parliamentary seats for the AfD in the 700-plus-member body. For observers outside Germany, alarming press headlines told the ominous story. 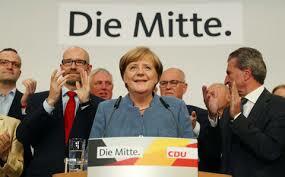 “Merkel Victory Overshadowed by Far Right Resurgence,” declared one. “Angela Merkel Makes History in German Vote, but so does Far Right,” the New Y ork Times recorded. “Germany’s ‘Boring’ Election Is a Victory for the Right,” concluded an op-ed writer. “Merkel’s Victory is dimmed by rise of Far Right,” was the message of most. The foreign media made it sound as if the AfD had just turned up in the night and scored a spectacular, unexpected coup. For most outsiders this was the disturbing takeaway: the extreme-right is again rearing its possibly fascist head in, of all places, the very birthplace of Nazism. For German citizens (and other Europeans) it was not a surprise at all. AfD spokespersons Alice Weidel (l.), Alexander Gauland (r). The reason that the AfD breakthrough was no surprise to Germans is that the party already has representation in 13 of Germany’s 16 state (or provincial) legislatures as of mid-2017; that it barely missed getting into the federal parliament in the last election (falling just short of the required 5 per cent of the vote needed for legislative entry); that it won seats among the German delegation in the latest European parliamentary elections; and that for the last two years, polling has shown the AfD running at somewhere between 10 and 15 per cent in national polls. So, the AfD election breakthrough was in fact expected here, along with Merkel’s win. Still, even though the far right party’s 12.6 per cent result was within the range of predictions, when it was actually confirmed on TV just after 6 p.m. last Sunday, it produced a thud of disappointment among center and left Germans. It was as if people were hoping not only against hope, but against reliable polling, that it just wouldn’t happen, that there would be a real last-minute surprise of the AfD fading. Okay, a total failure would be too much to even dream of, but maybe a finish under 10 per cent. Not to be. A few people took consolation in the fact that 87 per cent of German voters didn’t vote for the far right. The more interesting aspect of the AfD has to do with who and where and why they are. It’s a subject I’ll come back to momentarily, right after we wrap up the remainder of the evening’s counting. 4. Also in the running, the centre-right, “business-friendly” Free Democratic Party (FDP), a classical liberal party, finished fourth at 10.7 per cent, a substantial 6 per cent jump over its 2013 election results that saw it fall just short of the 5 per cent necessary to enter the federal parliament. The party is led by Christian Lindner, 38, a career politician (since the age of 21) whose charm was credited with the party’s success this time around. The FDP was followed by the left-wing eponymous Die Linke (Left) party at 9.1 per cent (marginally up by 0.5 per cent over last time) and the environment-identified Green Party at 9.0 per cent (also up a titch from its 2013 standing). All six of the above parties will be seated in the Bundestag, which portends a more fractious parliament than the previous one, when only four parties were represented. Given that Germany, like much of the rest of Europe, uses a proportional representation electoral system (which is complicated enough that I won’t bore you with an explanation of it – even if I could produce an accurate one, which is doubtful), the upside is that a broader diversity of voices tends to get heard than in first-past-the-post systems, such as exist in the U.S. and Canada. The downside in this fissiparous political era is that parliament is ever more fragmented and seldom is it possible for a single party to form a majority government. The result is coalition government, reached through often tendentious negotiations. The last German government was a so-called “Grand Coalition” of the CDU and the SDP, which between them commanded two-thirds of all seats in the Bundestag. This time matters will be a bit more complicated, since Social Democratic leader Martin Schulz immediately announced on election night that the SPD would not join a coalition if invited, but instead will sit in opposition. Schulz’s decision was a move that pleased many left-of-centre supporters who felt that the SPD’s identity had been swallowed up in the last parliamentary coalition, and that they had become nearly indistinguishable from their CDU senior partners, who appeared to have become more centrist under Merkel’s stewardship. In mid-week after the election, in one of his first party restructuring decisions, Schulz nominated Andrea Nahles as the first woman to be the SPD’s parliamentary party chief. Nahles, generally identified with the left wing of the SPD, was the labour minister in the last coalition government, and got good marks for introducing a minimum wage and tightening pension protections. Schulz’s backing of her for a high party post was taken as a good sign that he’s serious about refashioning a more militant party. The SPD move into opposition also has the collateral benefit that the AfD, as the party that finished third, will not be the leader of the opposition forces, a role that will be reserved for the second place SPD. 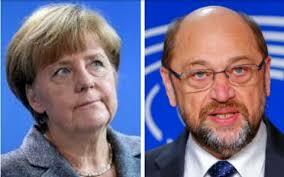 Perhaps the person most regretful of the SPD withdrawal from the present coalition is Merkel herself. She will now have to cobble together a government that includes the Free Democrats (FDP) and the Greens (together, the three parties have just over half the seats in the Bundestag), and she may face increasing restiveness from the CDU’s long-time sister-party, Bavaria’s CSU. If Merkel succeeds in bridging the considerable ideological differences between her potential coalition partners, she’ll end up with what will be known as a “Jamaica coalition” (since the party colours of CDU black, FDP yellow, and the Greens make up the colors of the flag of the Caribbean nation). Political maneuvering and far-right parliamentarians aside, it’s useful to remember the economic and political pillars that make German society fairly stable: a functioning manufacturing economy, very low unemployment rates, and leadership of a European Union that is itself showing persuasive evidence of recovery of growth in recent months. That’s why, despite the emergence of the AfD, there is no mood of national panic in the wake of the vote (unlike comparable situations in Austria and France this year). Still, that vaunted German stability and social order has not prevented the emergence of a “respectable” far right-wing party. Similar parties exist almost everywhere in Europe, from France’s National Front to Austria’s Freedom Party to Poland’s governing Law and Justice Party (PiS) and the far-right Hungarian regime of the Fidesz Party. There are even hard-right nationalist formations in Denmark, Sweden, and Finland, those long-time bastions of successful social democratic societies. But the existence of such a party in Germany feels different than elsewhere simply because of the historical elephant in the room, namely, a German history that produced a Holocaust and millions of other deaths during the Nazis’ 12-year-Reich. True, the German AfD is not a party of neo-Nazi skinheads in the punk getup of the 1990s, but what matters is not the costume but the ideology and the policy proposals. The anti-Islamic dogma extends to a more generalized xenophobia, and the xenophobia includes even next-door European neighbours who, thanks to the European Union agreement, have the right to free movement of labour as well as goods and services within Europe. 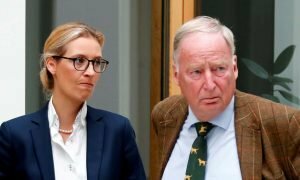 The people who support the AfD are the folks (or to use the historically-laden German term, Das Volk) who want to “take our country back,”and they are little different from their counterparts in Trump’s America or those – to quote Blake – in “England’s green and pleasant land” who voted for Brexit. What eventuates from that cluster of ideas is a version of “Euro-skepticism,” which took its most extreme form in Britain’s 2016 “Brexit” referendum when a narrow 52-48 per cent majority voted to pull Britain out of the EU entirely. Into this package, roll in a bit of nationalist nostalgia and social conservative leanings on the usual range of issues (from sexual preference to women’s rights to abortion). Various AfD figures have mused aloud that German soldiers of the first and second World Wars ought to be regarded with greater appreciation; that the nation’s atonement and reparations for past political crimes has become excessive; and that the country’s memorialization of the Nazi-caused Holocaust that resulted in the murder of 6 million Jews has gone too far (there’s barely muted disapproval of the memorial to the murdered Jews of Europe – a 5-hectare field of tombstone-like stelae located in the center of Berlin, not far from the iconic Brandenburg Gate). Alexander Gauland, a former minister in the government of Hesse province was among the most prominent of the founding figures. Last Sunday on television, he was one of the two “leading candidate” party spokespeople (the other is Alice Weidel) exulting over the election outcome, and promising to “hunt” down Frau Merkel in his new role in the parliamentary opposition. If the AfD had remained an ultra-conservative finance-focused formation it would likely still be hovering around or under the 5 per cent mark. But something happened, something that particularly affected Germany, and which explains much of the current emotional and political undercurrent that animates parts of the country. What happened was the refugee crisis, beginning with a flood of people driven from their homes in war-riven Syria, ever since 2011. Adding to the migration flow were also people streaming out of a half-dozen other disrupted societies, including Iraq, Afghanistan, and much of North and sub-Saharan Africa, along with various Palestinians, Iranians, Kurds and others. By 2014-2015, the flood had become a raging migratory river, and although many of the estimated five million Syrian refugees were sheltered in refugee tent cities in neighbouring Jordan, Lebanon and Turkey, those who were able to do so headed for Europe, either coming overland through the Balkans or entering ports in Italy and Greece, but with more economically amenable ultimate destinations such as Germany, Britain and Scandanavia in mind. Though the European Union was committed in principle to rescuing war refugees, in practise many countries in the 28-member EU (such as Poland, Hungary, and even France and Britain) were reluctant to take in the refugees from war. Already, by late 2014, groups had formed in Germany to oppose what was then a relative trickle of migrants. The most prominent of the groups was based in the former east German city of Dresden and known as Pegida (an acronym that stood for Patriotic Europeans Against the Islamisation of Germany); its rallies drew upwards of 25,000 people in a series of weekly demonstrations. It should be noted, however, that Pegida’s efforts to spark similar groups across Germany quickly fizzled and would-be Pegida-style demonstrators were consistently outnumbered by anti-fascist counter-demonstrators. When the anti-refugee supporters attempted to demonstrate at Berlin’s Brandenburg Gate, not only were they faced with counter-demonstrators, the city turned out the lights on the gate to express civic disapproval. By 2015, the raging river of refugee migration looked like a tsunami. At that point, “Mutti” Merkel made an unexpected decision. The motives for her decision are still debated, but the consequences of it were immediately visible. The Chancellor declared that, in accordance with EU policy, and the country’s constitutional laws, Germany’s borders were open to refugees. (The only country to do something similar, proportional to its smaller population, was Sweden.) In Germany, in 2015 alone, almost a million stateless people poured into the country, and Merkel encouraged a “welcoming culture” to foster acceptance and integration of the strangers. The policy – whether exaltedly humanitarian, merely legalistic, or shrewdly economic in the face of an aging population – was administratively overwhelming, as German bureaucrats scrambled for even office space in which to process the immigrants, much less finding them dwellings and initial forms of support. There was a very visible amount of administrative and on-the-ground chaos, and eventually Merkel began to scale back the open door policy as opposition mounted, especially opposition within her CDU party. Eventually, an uneasy deal was struck with Turkey to hold back the refugee flood, and many European countries simply closed their borders. Without reprising the entire history of the Merkel policy, the short version is that the AfD quickly seized the opportunity to make immigration its central (and perhaps only) doctrine; to scoop up the energies and support of populist groups of anti-refugee demonstrators like Pegida; and to magnify the inevitable incidents of “culture clash” (such as a massive and bizarre sexual harassment of women in Cologne by North African immigrants during the 2016 New Year’s celebrations) and terrorist episodes (such as the killing of a dozen people in a Berlin Christmas market in December 2016, carried out by a Tunisian drifter who hijacked a transport truck and drove it into the holiday crowd in the capital). All of this unease with refugees coalesced into support for the AfD that fluctuated between 10 and 15 per cent, and settled at 12.6 per cent in last week’s election. “The good life” in Germany. 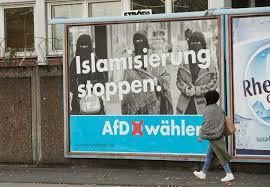 By stark contrast, the AfD campaign, which looked like something out of an American advertising agency, was aggressive, clever, witty and vicious. 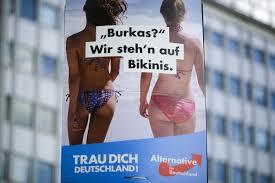 “Burkas?” asked a big poster featuring two strolling female bottoms clothed only in skimpy swim-suits. “We prefer Bikinis,” snickered the poster. 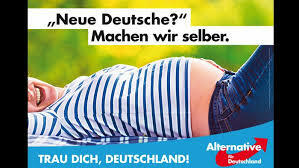 Another attention-getting AfD ad showed the pregnant bare belly of a women, asking, “New Germans?”, and snappily answering, “We make our own.” Although the tone was far from the rather dowdy actual presence of AfD figures, it presented the hard-line doctrine of the party in witty, bright images. But although such stereotypes may be comforting, the actual AfD is younger and more literate than the cartoon characters they’re often portrayed as being. Although they’re certainly not a solid bloc of elderly reactionaries nor do they appear to inspire much enthusiasm among the young Millennials, a significant aggregate of the far right adherents are people in their late 30s and 40s, approaching middle age, who are often educated but not highly educated (they tend toward technical diplomas and real estate licenses rather than Ph.Ds in art history). They’re obviously not neo-Nazi thugs; instead they’re respectable lower-middle-class types justifiably feeling that the future is precarious or even that they’ve already been left behind in a glitzy, digital world they don’t quite understand. In terms of the AfD’s expanded support, a large slab of it came from people who didn’t vote in the last federal election; another slice of votes was peeled off from discontented CDU voters who opposed Merkel’s progressive refugee policy; and a lesser but significant chunk came from, surprisingly, people who had voted for the Left Party in the past. The latter political shift is actually not that surprising, since most of those new AfD votes came from the former East Germany, where the successor to the old communist party (which later merged with disaffected leftist former SDP supporters to form the Left Party) inherited some of the old almost ritual communist vote, and now lost it to the seemingly more relevant AfD. The one point in all this nose-counting that should be underscored is that the AfD vote was 12.5 per cent. That’s far less than the 35 per cent approval ratings for Donald Trump in the U.S., or the third of the French electorate willing to cast a ballot for National Front presidential candidate Marine LePen, or the more than 40 per cent of Austrians who almost elected a far-right Freedom Party presidential candidate to be head of state. The year 2017 began with considerable consternation about whether a wavelet of right-wing populism was about to wash over Europe. The fears were inspired by the Brexit vote in Britain, and by the surprise election of populist Donald Trump in the U.S. in 2016. As it turned out, the results of 2017 elections in the Netherlands, Austria, and Emmanuel Macron’s victory in the French presidential contest, all suggested that perhaps the high tide of populism has been staunched. Regressive or “illiberal” regimes (as they’re politely called) within the EU, such as the Hungarian and Polish governments make it clear that at the very least, right-wing populist formations in Europe are here for foreseeable future. That Germany has acquired such a party and that it’s here for a while is not especially shocking, and its 10-15 per cent support does not pose an imminent danger to German democracy. With respect to the EU itself, the Brexit vote in Britain last year and the consequent Tory-led bumbling negotiations to withdraw from the EU have had the interesting counter-effect of increasing support for the supranational consortium of European countries within Europe. Grumbling about the top-heavy EU bureaucracies has subsided somewhat as the European economy has recovered in recent quarters. There’s also widespread recognition that there needs to be further EU reform and those reforms will entail, in a sense, “more Europe.” A potential leader in the movement toward a more politcally and financially integrated Europe is the youthful French president Macron, who gave major speeches before and in the wake of the German elections. Although Macron’s pro-European sentiments are clear, what is uncertain is precisely what kind of Europe he has in mind – a more neoliberal Europe, a Europe willing to renounce punishing austerity programs (like the one imposed on Greece), or a more left-leaning continent? In any case, a genuine push for a better Europe will require a figure like Merkel to spearhead it in consort with Macron. So far, all of this is talk, and there are few signs that real actions are imminent or likely to succeed. In the meantime, a somewhat weakened Merkel, now entering the twilight of her political career, is more preoccupied with fashioning a coalition for Germany, one that will include a somewhat Euro-skeptical party of free marketers. It’s not going to be easy. Welcome to further adventures in the Age of Unease.